I pulled a lot of stuff out, tidied up the ribbons and the paper, rearranged the contents of a few drawers and in the end, it looks a lot better. As an added bonus, I realized I have indeed been using up ribbon which was a goal of mine starting out this year because I clearly have a bit too much (I had them stored in different places before moving into this house and had no idea how many duplicates I had). This kind of storage would never work for me if I couldn't hide it behind a door. I'd go nuts with how cluttery it looks but since it does close up, the clear drawers are perfect so I can see what's inside and I do find that the majority of my craft supplies have logical spots and are easy to access. 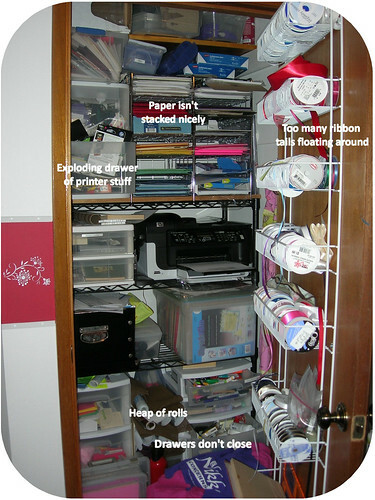 My favorite part is the ribbon storage though. 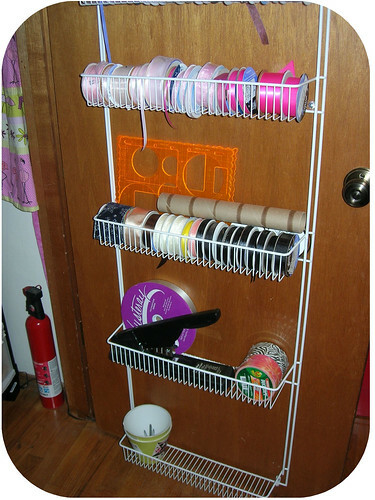 That's just a simple pantry organizer from the hardware store. It's just a big version of this. 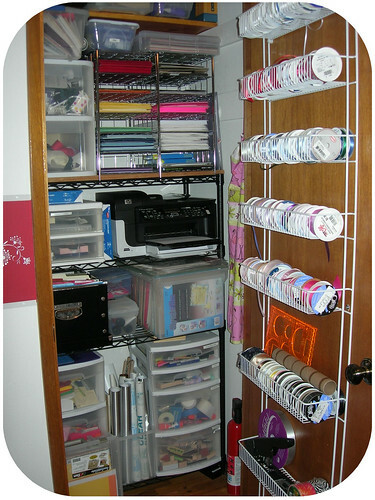 That is such a great idea for ribbon! Right now I use clear storage boxes but I have to reorganize them every time I take a roll out. Kind of a pain. This would be great over the door to my craft studio. Thanks for the great idea! Marvelous job of organizing! You put me to shame! 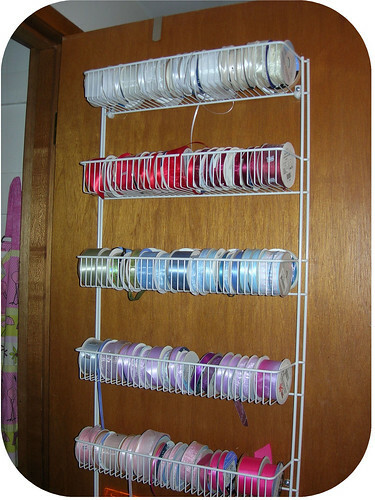 My teas have to move because I love the idea of using that rack for ribbon though I have no door space for it, I'll find a way to mount it. Exquisite use of a small space! I am impressed, thanks for sharing. Thank you!! Your poor teas, homeless, but I must say, the ribbon rack does work great. You can pick up little hooks that you screw into the wall in the organization section of your local home improvement store. They'll have them by the wire closet systems. It's a white hook that you put a screw through that the pantry organizer clips onto. Good luck!! I'm so glad the idea will help you. Thanks for stopping by my blog! this is amazing! Organization is the key to everything! I can only say professional way to organise your closet. Keep it UP.